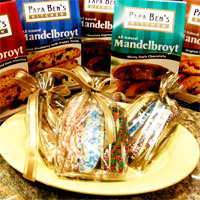 "For a delicious twist we spruce up our family's Mandelbroyt by dipping them in chocolate and adding our favorite toppings! They are the biggest hit!" 1. 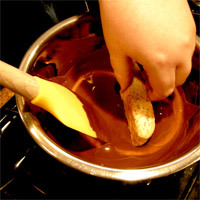 Melt your Melting Chocolate or Almond Bark according to the directions on the package. 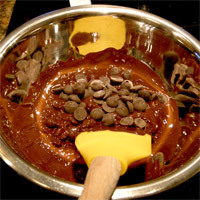 We melted our Melting Chocolate in a double boiler. 2. 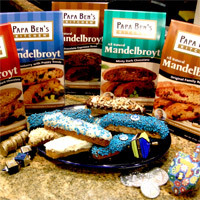 Dip the PBK Mandelbroyt on one side lengthwise, coating it generously. 3. 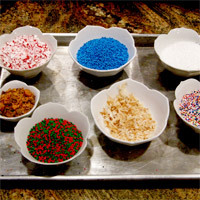 Sprinkle with your favorite toppings: chopped nuts, toasted coconut, nonpareils, candies, sprinkles, crushed butterfingers or almond roca...the sky is the limit on this part! 4. 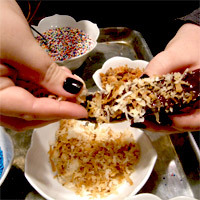 Make sure to coat generously, and while the chocolate is still warm on the cookie, so that your delicious sprinkles adhere properly. 5. 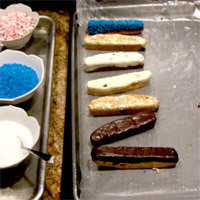 Lay onto cookie sheet lined with wax paper. Put into the freezer for 10 minutes to set the chocolate. Follow the directions on your chocolate's package, as setting time varies depending upon brand. 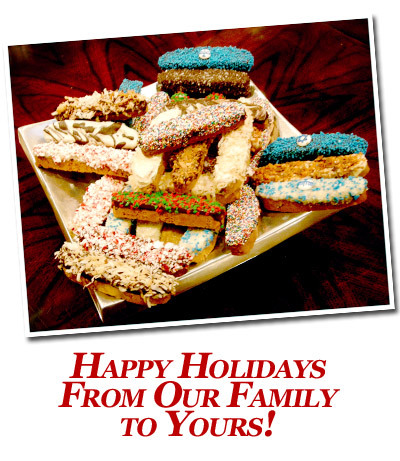 Create festive trays with Hanukkah themes! Create festive trays with Christmas themes! 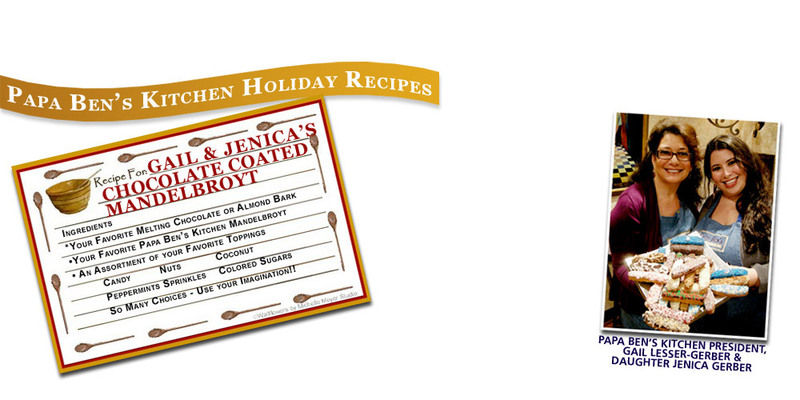 • Great for any Holiday or Birthday! Or just because.....you get the point! • PEPPERMINT WARNING: If you use crushed peppermint always put into a seperate container as this flavor is very strong and will spread to your other Mandelbroyts. • This is a great activity to do with children. Their eyes light up as they get to express their creativity and be part of the family tradition! 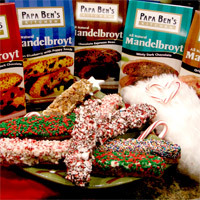 Chocolate Covered Papa Ben's Kitchen Mandelbroyt with your favorite chocolate and toppings can be addictive!